Rice farmer John Gaulding wades through the roughly 8 inches of water still filling his fields in rural Hamshire, Texas. At its worst, he says, the water was as high as 30-36 inches. In south Texas, this was going to be one of the best years farmers had seen in a while. The cotton crop was projected to bring in record prices and even clear out many families' debts. But the massive rainfall, winds and a slow drying-out process from Harvey have left many farmers overwhelmed and worried. That includes people like Dave Murrell, whom I meet at AL-T's Seafood and Steakhouse, a Cajun restaurant in Winnie, Texas, a rural town about an hour east of Houston. The place is packed, even though lunchtime has long come and gone. No one is in a hurry to get back to their fields — they can't. They're flooded. Murrell says nearly 400 acres of his rice are totally submerged. "There is not much we can do," says Murrell. "We are still waiting for the water to go down so [that] by road we can get into these fields. Our roads cross a gulley out at the farm and the water is still too deep for us to get through it." Luckily, Murrell had just harvested some of his rice before Harvey dumped nearly 50 inches here. But fourth-generation cattle and rice farmer Gerald Bauer decided to bring his cows in first, then cut his rice crop. Unfortunately, he says, he miscalculated by one week. In "a normal year, we're fine," he says. "But Mother Nature decided we were late this year." Adam Leger, who runs an aerial fumigation service with his brother, says they won't know for weeks if any of their equipment is salvageable. Four of his crop dusters are under water at the local airport. "I've never seen it — nothing like this," Leger says. "I don't think anybody in here has seen it." It will take months, maybe even a full year, to get final figures on Texas' agricultural losses to Harvey. But Gene Hall of the Texas Farm Bureau says he's done some back-of-the-envelope calculations. Roughly, Hall says just looking at cotton, Texas's No. 2 product, farmers lost at least a fifth of the crop. "We think that it could be as much as $135 million" in cotton losses, he says. And Hall says for rice farmers, 20 percent of their crops are still stuck in the ground. Rice farmer John Gaulding pulls on tall rubber boats up to his knees to get through the water – about 8 inches tall — still filling his fields in Hamshire, Texas, about 9 miles outside of Winnie. At its worst, he says, the water was as high as 30-36 inches. Gaulding, who's 71 and took over the rice business from his father, faces a frustrating situation. Rice stalks sit atop his plants, ready for harvest. With each passing day, though, the kernels get drier and drier, while the bottom of the plant remains flooded — too wet to bring in any machinery. "The sad thing is that out of all the fields we've harvested, this is a new variety to us and it had the potential to be our highest-yielding," Gaulding says. And unlike other rice producers who will plant a second crop later in the year, Gaulding farms crawfish on this field. The small crustaceans burrowed into the ground to hibernate. He won't know whether they survived and will reemerge until next spring, possibly adding to his losses. Farmers in Texas say they feel like the rural families and businesses have been forgotten in the rush to help the cities, especially Houston. They're even more worried they'll be left behind as attention turns to south Florida and Hurricane Irma's likely arrival in a few days. Right now everyone here is just trying to be patient, like Marcia Bauer, who owns Texas Salt Grass, the local feed store in Winnie. She says half of her monthly income is from credit she gives out. "And it's not just me that is being affected. Because we are such a small rural community, a lot of the businesses carry the farmers," Bauer says. She sent out her statements the day before the town flooded. Hopefully, she says, the farmers finally got her bill — now that mail service is back up and running. In Texas, this was going to be one of the best years farmers had seen in a long time. The cotton crop was projected to bring in record prices and even clear out many families' debt. But as NPR's Carrie Kahn reports, the massive rainfall, winds and slow drying-out process have left many farmers overwhelmed and worried. CARRIE KAHN, BYLINE: At Al-T's Cajun seafood restaurant in Winnie, Texas, the place is packed even though lunchtime has long come and gone. KAHN: No one is in a hurry to get back to their fields. They can't. They're flooded. 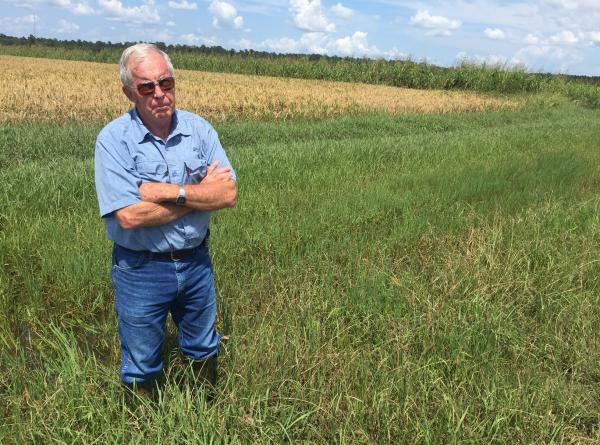 David Murrell says nearly 400 acres of his rice are totally submerged. DAVID MURRELL: There's not much we can do. We're still waiting on the water to go down so by road we can get into these fields. We've got - our roads cross a gulley out at the farm, and the water is still too deep for us to get through it. KAHN: Luckily Murrell had just harvested some of his rice before Harvey dumped nearly 50 inches here. But fourth-generation cattle and rice farmer Gerald Bauer decided to bring his cows in first, then cut his rice crop. Unfortunately, he says, he miscalculated by one week. GERALD BAUER: A normal year - we're fine. We can get in, cut it. We're not late. But Mother Nature decided we were late this year. KAHN: For Adam Leger, who runs an aerial fumigation service with his brother, they won't know for weeks if any of their equipment is salvageable. Four of his crop dusters are under water at the local airport. ADAM LEGER: I've never seen it - nothing like this. I don't think anybody in here has seen it. KAHN: It will take months, maybe even a full year to get final figures on Texas' agriculture losses to Harvey. Gene Hall is with the Texas Farm Bureau. GENE HALL: I did some back-of-the-envelope calculations. KAHN: Roughly, Hall says, just looking at Cotton, Texas' number-two ag product, farmers lost at least a fifth of the crop. HALL: We think that it could be as much as a $135 million. KAHN: And Hall says for rice farmers, 20 percent of their crops are still stuck in the ground. KAHN: Rice farmer John Gaulding pulls on tall rubber boots up to his knees to get through the high water still filling his fields. How high is this water we're standing in? JOHN GAULDING: Oh - what? - about 8 inches. KAHN: And how high did it actually get? GAULDING: Up to the top. GAULDING: I'm going to say 30 to 36 inches. KAHN: Gaulding, who's 71 and took over the rice business from his father, faces a frustrating situation. Rice stocks sit atop his plants, ready for harvest. With each passing day, though, the kernels get drier and drier while the bottom of the plant remains flooded, too wet to bring in any machinery. GAULDING: The sad thing is, out of all of the fields we've harvested, this is a new variety to us, and it had the potential to be our highest-yielding. KAHN: And unlike other rice producers who will plant a second crop later in the year, Gaulding farms crawfish on this field. The small crustaceans burrowed into the ground to hibernate. He won't know whether they survived and will re-emerge until next spring, possibly adding to his losses. Farmers in Texas say they feel like the rural families and businesses have been forgotten in the rush to help the cities, especially Houston. They're even more worried they'll be left behind as attention turns to South Florida and Hurricane Irma's likely arrival in a few days. Right now, everyone here is just trying to be patient, like Marcia Bauer, who owns Texas Saltgrass, the local feed store in Winnie. She says half of her monthly income is from credit she gives out. MARCIA BAUER: And it's not just me that's being affected. 'Cause we are such a small, rural community, a lot of the businesses carry the farmers. KAHN: She sent out her statements the day before the town flooded. Hopefully, she says, the farmers finally got her bill now that mail service is back up and running. Carrie Kahn, NPR News, Winnie, Texas. (SOUNDBITE OF VALERIE JUNE SONG, "WORKIN' WOMAN BLUES") Transcript provided by NPR, Copyright NPR.